Three of the club’s teams, peewee, junior bantam and bantam, played hard-fought games on Nov. 20 at John Oliver Park. Coquitlam Vikings defenders stop a North Delta Longhorn’s drive for the red zone during the Vancouver Mainland Football League championship game at John Oliver Park on Nov. 20. It was a heartbreaking weekend for the North Delta Longhorns. 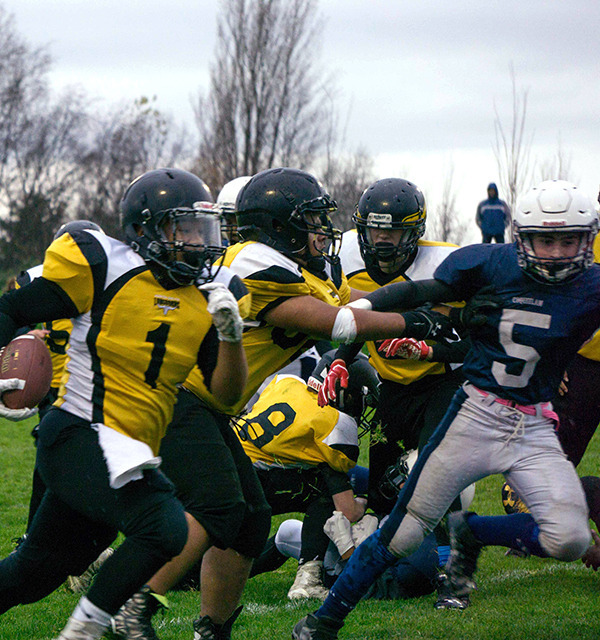 The junior bantam team and Coquitlam Vikings battled like stags for the Vancouver Mainland Football League (VMFL) cup, but the Vikings proved too much, downing the Longhorns 26-0. As VMFL champions, the Vikings will proceed towards provincials. Earlier in the day, the Longhorns’ peewee team lost to the South Delta Rams 12-6 in the first round of the Commissioner Cup semi-final, and the club’s bantam team lost to the Langley Mustangs 20-0 in their final regular season game. The junior bantam Longhorns couldn’t seem to find any holes on Sunday, save for the ones in their own defence that cost the team two touchdowns and a stomping two-point conversion, leaving them behind 14-0 at the end of the first half. Vikings’ running back Tremel States-Jones managed to push through a defensive gap for a huge 50-yard sprint for the first major of the game. Soon after, another gap in the linebackers yielded a similar Longhorns folly, leading to another 50-yard run for goal. Seeing Tremel run down the field with no one able to catch him is awesome,” said Vikings’ player Massimo Ryan. In the second half, the Vikings kept up the pressure, pushing the Longhorns’ defensc into their own end and eventually crumbling them at third and inches for the game’s final touchdown late in the fourth quarter. As the winning team hoisted high their golden football trophy at the 55 yard line, cameras flashing off their bright grins, Galloway huddled the Longhorns beneath the shadow of their bench area for a sober debriefing. While the Longhorns dispersed with their shoulders slumped, Galloway remained hopeful for his players.